DNA quantitation, β-galactosidase, and β-glucuronidase assay kits and cuvettes, as well as a broad range of filters, are available for use with the VersaFluor fluorometer, which is now discontinued. 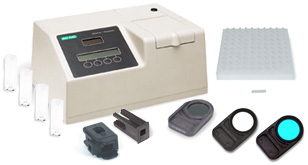 VersaFluor™ Fluorometer - The VersaFluor fluorometer is now discontinued, but cuvettes, filters, and other accessories are still available for current users of the instrument. Fluorescent Assay Kits - Three fluorescence assay kits are offered for DNA quantitation, β-galactosidase reporter assay and β-glucuronidase reporter assay.